He would need to sell 100 of them, and he had estimated cost of around $150. But asked me if I had or knew of any detail drawing of what the suit looks like aside from pictures so he could get a firmer quote. So my question would be is there enough people interested to do it and is there a blue print out there for the suits? I am interested too. I sent an email asking if they can modify the X wing vest to the U wing vest since it is just some added material at the front bottom.... I think it would be pretty straight forward to do. I would be interested as well. I'll spread word about this! I'm not aware of any patterns available for the suit but there are lots of pictures out there. I can help collect pictures if desired. The standards might also help a bit. They will also have a BS jumpsuit only option starting this coming wave. 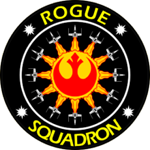 Y'know, if he does make the Blue Squadron suit, he could also make the orange RO X-wing suit, too... It's the same pattern, just a different color and without the pleating on the sleeves... Just add the code cylinder pocket. I wouldn't even mind having one of those suits, too. And yeah, the U-wing flak vest would be another easy addition. It's pretty much the same pattern as the RO X-wing pilot, just with a longer bottom on the front panel and made with a slightly darker material. And if he makes the gray gloves then maybe he could make the black one, too, as they're just a different color. He could sell three different outfits with essentially the same patterns. I'd likely be interested. Finding the right texture and color of fabric for this has been tricky. If it is accurate snd has a sub $200 price tag, I can get onboard.